The Trans­por­ta­tion Investment Act marks a milestone this month with all of the area’s “Band 1” construction projects now underway. The panel of residents assigned to review spending of the regional 10-year transportation sales tax gave this phase of projects its blessing Wednesday. “There has been a huge amount of work done, without increasing the amount of staff,” said Augusta banker Phil Wahl, the chairman of the four-member panel. The 13-county region including Augusta was one of just three statewide where voters approved the new tax in 2012. Band 1 kept Augusta’s engineering department extremely busy in recent months, as city staff are assigned to manage 22 of the 34 Augusta projects, Traffic Engineer Steve Cassell said. The projects consist of four road resurfacings, 15 road projects, eight bridges, five traffic control projects, one involving public transit and two at airports, he said. Augusta Band 1 projects totaled $97 million, but “blended” projects – using the transportation tax money as well as state or federal funds – bring the total to about $150 million in road construction underway or about to be, Cassell said. “If you’re frustrated with barrels right now, look out. It’s going to be rough,” he said. Across the 13-county region, bids have been awarded to contractors in all but two of Band 1’s 49 projects, said Kelvin Mullins, the tax program administrator for the Georgia Department of Transportation. Bids for those two projects – Robin­son Avenue in Grovetown and Wind­sor Spring Road Phase 5 in Augusta – will be awarded by year’s end, he said. 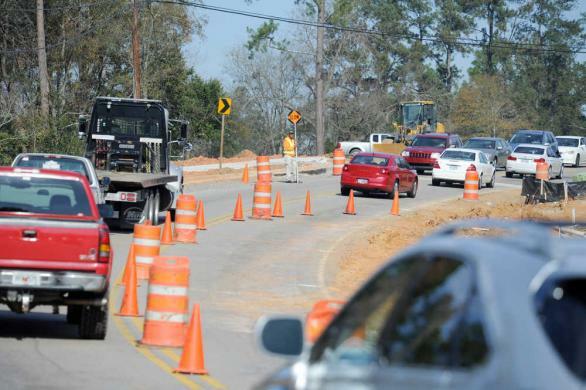 Traffic was backed up in the busy Fort Gordon suburb Wednesday, but the work on Robinson Avenue, a two-year project, will likely increase congestion, Mullins said. “It’ll get worse in Grove­town before it gets better,” he said. Overall, Band 1 projects are $10 million under budgeted amounts, Mullins said. The tax has raised $174 million, including $44 million distributed to counties for discretionary road spending, he said. Other Band 1 projects in Columbia County include improvements to Wrightsboro Road around Grovetown and the extension of River Watch Parkway. State and local officials will celebrate the completion of one of Augusta’s larger projects receiving the tax funds with a ribbon cutting at 10 a.m. Wednesday. The $21 million Wrights­boro Road expansion project, funded with local, state and federal funds, was the first Band 1 project let to contract in Au­gus­ta and included $1 million from the transportation sales tax.